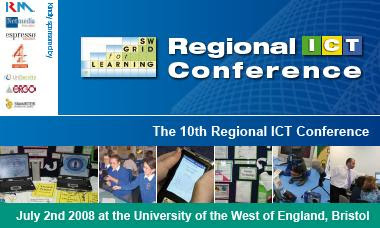 July 2nd sees the 10th South West Regional ICT Conference to be held at the University of the West of England here in Bristol. This one day regional ICT conference, is a fantastic locally organised event aimed at members of the whole school community from classroom teachers to school governors. It is an opportunity to celebrate with colleagues and share in their experiences of using ICT in the classroom through presentation and seminar, to network and explore tools first hand with exhibitors, while gaining inspiration from the endeavours of a diverse community of practice. This year keynotes come from Doug Brown, John Davitt and Russell Prue. To get a flavour of what is happening at this year's event the programme can be downloaded from here, while an archive of presentations and audio files from previous years including last years inspirational key notes by Prof. Stephen Heppel and Lord David Putnam are available here. I have exhibited student work a couple of times at the conference, but this year am really looking forward to the opportunity to share some of my experiences in a presentation around cross curricular opportunities for Control. Inspired by Doug Dickinson this is hopefully going to be bit of a blogging experiment too. I am saving the rest for later.